Sounds like a show on the food channel… I’m referring to adventures with the piglet mentioned in last week's blog that is living in my house. Okay, not so much in my house, but definitely under my roof. Bacon is a funny little critter. He likes to be scratched behind his ears, under his chin and have his back scratched. We have him in a small dog kennel currently. On the days I work out in my home office, adjacent to his current quarters, I move his cage in with me so he isn’t so isolated. He is actually a very social creature. He makes pig noises at me and does things to get my attention. I’ve concluded Bacon needs exercise. He hops around in his cage like my cat does when he gets wound up and twitchy just before he takes off running out of the room. 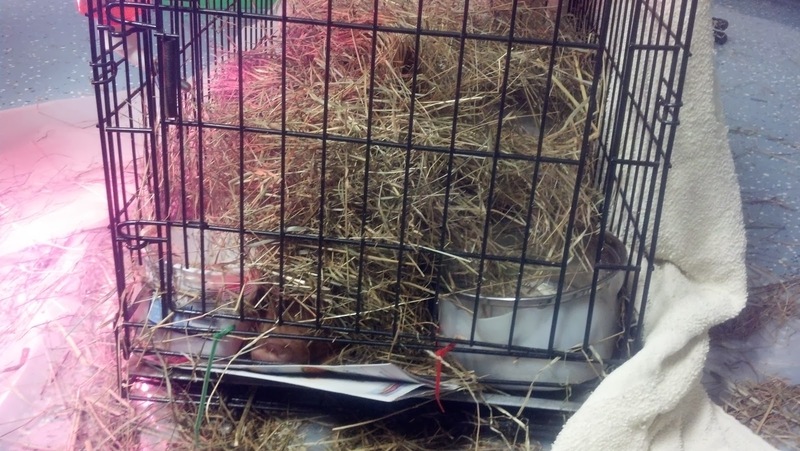 Last night when I was changing Bacon's bedding, I let him run around in the shop. Like a dog he would walk around and check everything out. There are a few bottles of water in the cage with him that serve as a heat sink with the heat lamp, giving him something warm to snuggle up to. (Similar to human babies, it takes some time for their body to learn to regulate temperature.) As I placed these bottles outside the cage, he started pushing them around the room with his nose. They seem to also be his toys. 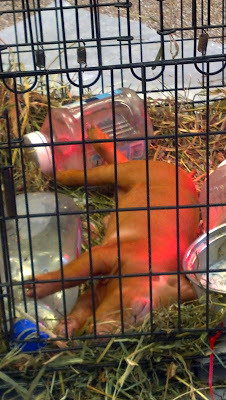 He is doing fine drinking his milk replacer from the pan and while I was out Christmas shopping yesterday, it appears he even drank from the guinea pig water bottle that I have on the side of the cage. While Bacon is cute and looks soft, his hair is very coarse and he is not soft to the touch like you might think. He has teeth, so you have to watch him. He already tried to nibble on my hand when I was pulling out his milk pan the other day. Last night I felt him biting on my boots while I was changing the cage. He can’t be trusted. Our two-year old son likes to go out and see the pig each day. “See pig, see pig!” Will isn’t such a fan when the pig wants to see him. Then they both end up squealing. 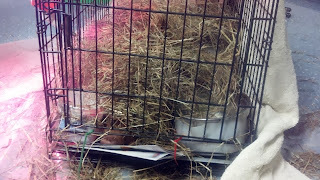 Burying himself in the hay after I changed the bedding. 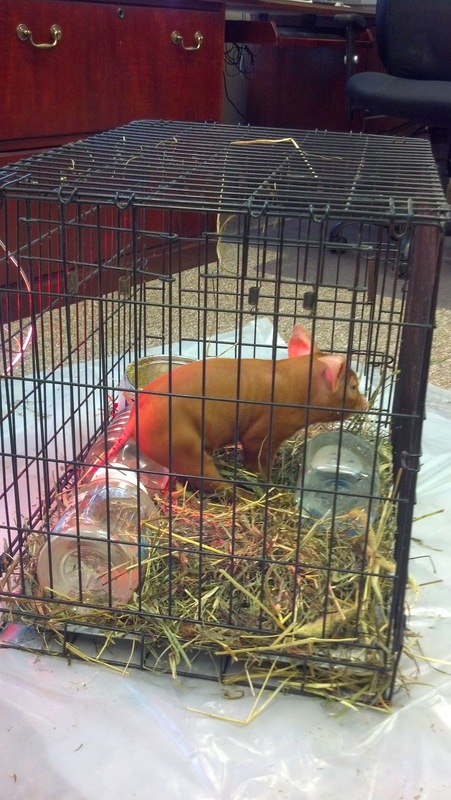 You can see a pig snout in the bottom left corner of the cage. Just in the week Bacon has been at our house, he has quickly grown in size. I definitely don’t see him staying long. The plan is to move him in with the next litter of piglets when they wean. Speaking of which, mama sow #2 has clearly dropped and is bagging up. I wouldn’t be surprised if her piglets come this week. Stay tuned and enjoy these new photos of Bacon’s life on Fork Right Farm!